eMints are the minting instances and authorities within the fairCASH system, performing the coinages/mintages of eCoins, their inital distribution and final clearing. Our system allows for the operation of multiple eMints as it is able to separate and isolate eMints from each other. It makes the technical risk-management handling of eCoins, certificates, or responsibilities much easier within the fairCASH monetary system. The whole responsibility for eCoins is restricted to a sole eMint! Due to the fact that several eMints for several currencies will coexist, all of them are isolated from each other and from the technical fairCASH system itself. The fairCASH organization has no control, access, or even knowledge about the minting keys of any eCoin floating into the system, and is in this way proven innocent in a possible involvement of the business of creating, releasing, revoking or clearing monetary objects. On the other side, customer convenience is a killing issue. To assure, that customers can have their bank account on other banks than the eCoin issuing, one they don’t have to wait more than a few seconds for transferring their giral money back and forth to eCoins (from their bank accounts), the eMint can be a business entity for all financial banking institutes in the same currency area. Transferability in-between withdraw and deposit at the eMint ATM. 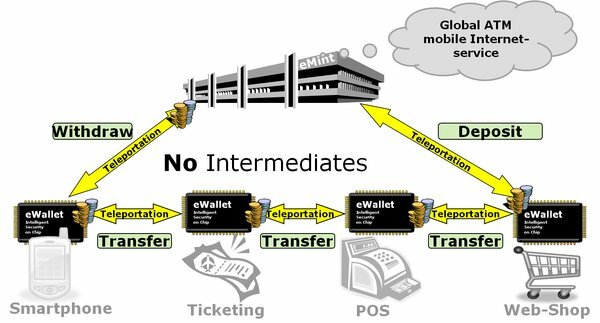 As depicted in this figure, the eMint appears for the users of the fairCASH system as an Internet service of a global ATM, able to route money between the eCoin and the account subsystem.